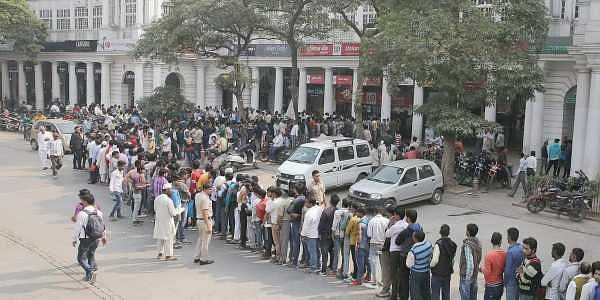 For a large number of working men and women it was a loss of income as they stood in serpentine queues at banks to exchange the spiked notes for new ones. NEW DELHI: Large companies and bankers, employees and customers, as well as small and medium enterprises have all vented their anger at the demonetisation announced by the government on November 8 last year. But the common man and woman have not been heard enough, though they are the ones that most felt the pain when money suddenly became scarce and their way of life was shaken to the core. Over a hundred persons died in the queues. One such man in central Delhi was Saud-ur-Rahman, a 48-year-old poster designer. Standing in a bank queue for the third day in a row, from early morning till late afternoon, he suffered a massive heart attack and was brought dead to the hospital by his friend. "Our child has gone. We couldn't speak to him one last time. Why would I want to speak about him to others," his 70-year old father Ahmed Rahman told IANS before shutting the door and cutting off any more queries. The pain felt by the father was as real today as it was a year ago. Shiraj Ahmed, the friend who took him to the hospital, said that no one from the ruling party came to express condolences or offer an apology. Shiraj had given Saud some money and told him not to go, perhaps sensing the desperate situation he was in, but he insisted he had to take out money or the family would not be able to manage. In many cities, people recalled the harrowing time they underwent to withdraw their hard-earned money, day after day. "The dividend of the hardship we faced was expected to be moral. But, one year down the line, what we got as retired persons is receding interest income," says retired central government employee Bankim Chandra Roy. "I had to go to the branch four to five times to convert about Rs 10,000 of demonetised notes; one day, I fell and injured my head," says the pensioner. "I used to draw my pension in the first week of the month. But when demonetisation came, I just could not draw my pension and really had to struggle to manage family expenses," Roy, a resident of West Bengal's Hooghly district, told IANS. "It was as if somebody had suddenly snatched all my money. I had to struggle to get even Rs 4,000 in new currency from my bank to buy essentials," recalls Damodar Reddy, a pensioner in Hyderabad. Caught completely off-guard, people did not know how to meet immediate financial commitments like paying house rent, children's school fees and other monthly expenses. But the most immediate need before the common man was to buy his daily needs like grocery and fuel with new currency notes which were elusive. "People had to face hardships, especially those who were not tech-savvy and relied on cash for their daily transactions," Aashish Joshi, a chartered accountant, told IANS. He wondered why so many had to go through so much pain. "It was believed that the dramatic move would have positive impact and the so-called black money would be cut back. But statistics released by the Reserve Bank of India (RBI) show that 99 percent of the demonetised currency came back into the system," Joshi said, wondering whether all the pain was worth it. Anne Bangera, a 71-year-old retired teacher based in Mangaluru, recalls the demonetisation period being particularly painful as all her pension savings were held in cash. "It shook me as it meant all the money I had saved was of no value any more. I require to make monthly visits to the hospital for my health, but I no longer had any valid money," Bangera said. An arthritis patient, Bangera lives alone at her home. "With bad knees, standing in those queues was particularly painful and I had to make several trips to the bank to deposit my old currency in return for the new notes. For the old and the weak, demonetisation was very difficult, as it just left us helpless," she said. Rahul Chauhan, who runs a car garage in the Kamla Nagar area of North Delhi, says that for many days they were left with no money, even to pay the workers -- many of whom started staying away. "I spent many nights standing in the queues, and then the customers did not turn up to claim their vehicles since they couldn't pay cash," Chauhan said. Kailash Sharma, a resident of South Extension in Delhi, said that going to the banks became a family affair. "My father, mother and me stood in queues for over seven hours each day, since one person could withdraw only Rs 4,000." Sharma mentioned that exchanging the cash at home became a highly challenging task for them. Self-employed young men did not know how to manage for several weeks. Twenty-seven-year-old Prashanth K. (name changed on request), a wedding photographer in Bengaluru, said many weddings in the state turned low-key after November 8 last year. "All the money saved for weddings had become worthless and had to be exchanged. Even the withdrawal limit -- which was raised to Rs 2.5 lakh for weddings -- was useless because of the conditions attached," he said. The result: "I had to spend many hours of each week in bank queues trying to exchange old Rs 500 notes I was paid." He could not refuse old currency as business would have vanished, although he did reduce his assignments. For several months, the photography business remained dull, despite the wedding season, he said. Small start-ups, often lacking deep pockets, were no better off. Adnigam Private Limited, a hyperlocal marketplace launched only six months before demonetisation, was nearly knocked out of business. Its USP was same-day delivery in and around Hyderabad, but it was forced to retrench staff and cut operational and overhead costs. Raji Reddy Kesireddy, founder and CEO of Adnigam, said there were days when they had no orders. "From a spacious office in Ameerpet, we had to move to a small premises in Begumpet," he told IANS. The situation was exploited by touts who suddenly sprouted up everywhere. D. Saraswati, a worker in a private school in Hyderabad, recalls that she had to part with Rs 300 to exchange each Rs 1,000 note. "Had I stood in a queue, my employer would have deducted a day's salary and still there was no guarantee that I would get the money. I had no other option," she said. The pain was spread across the country for several weeks and months, but no one is sure today whether all the sacrifices by the common man and woman resulted in any real benefit. They look askance at the government, which has few answers.